Sturdy but elegant, these vintage tolix style metal bar stools stand 24" inches high and come in a set of four. 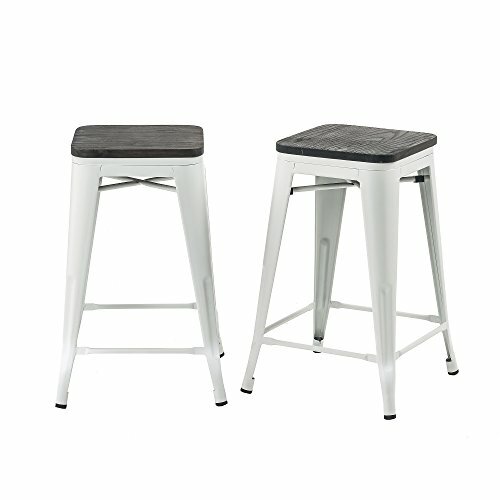 Already fully assembled and stackable for easy storage, these outdoor bar stools are perfect for commercial use in a bar or bistro patio, or as outdoor seating in a cafe or restaurant, with their attractive matte white finish and natural wooden seat, they also make a perfect and practical choice for use in a home garden or deck. Also suitable for indoor use, the backless design of this set of 4 bar stools makes for an appealing vintage industrial touch to a home bar or kitchen. 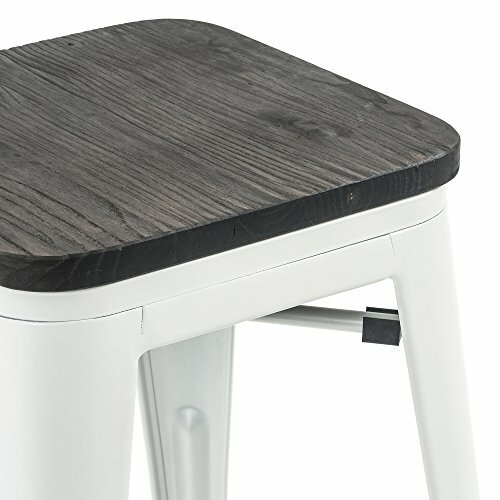 Perfect as standalone seating, these 24 inch stools also pair well with a high table, a freestanding bar or a built in countertop, with durable construction that will stand up to regular use in an outdoor environment. Whether for home or commercial use, make your bar seating a point of conversation, instead of just chairs. No assembly required.Keep away from rain. 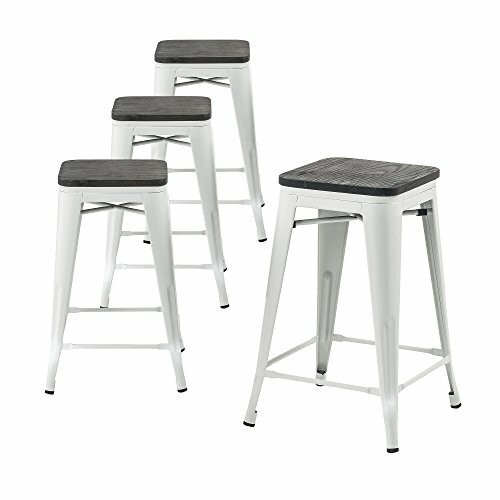 Features: Each metal bar stool has a brace under the seat that provides additional support and stability durable enough for use in the shop or cafe, and stylish enough to use at home easily and neatly stacked together for storage scratch and mar resistant non mar foot glides heavy duty steel construction grayspecifications:Weight limit: 300lbseat dimension: 12"(w) x 12"(l)stool weight: 9lboverall dimension: 17"(l) x 17"(w) x 24"(h)" superior design: Industrial style modern gray backless bar stool with wood seat will enhance any space excellent materials: Scratch and mar resistant steel with excellent grey coating.